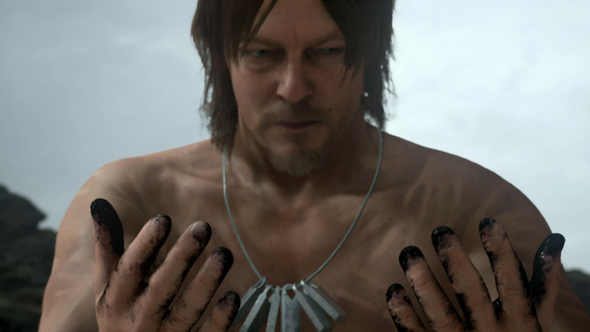 Death Standing director Hideo Kojima has tweeted a photo of a real-life replica of the oddly-shaped dog tags worn by Norman Reedus’s character in early trailers. He’s considering selling them as merchandise, but there’s a more interesting detail: stamped upon them is a mathematical equation. What else is there to get excited about? Explore the horizon with our list of upcoming PC games. As a reply on Twitter and a thread on Reddit have both pointed out, the equation is the Schwarzschild radius. This is the radius of a sphere such that, if all the mass of an object were to be compressed within that sphere, the escape velocity from its surface would equal the speed of light. If a star were to collapse to equal or below this radius, light would no longer escape it.This is how you get black holes. This is another hint that Death Stranding’s themes will touch on space and time. It seems fairly clear that the setting we’ve seen so far is otherworldly – all sorts of spooky and weird stuff happens – and Mads Mikkelsen’s squad of soldiers in the second trailer mixes infrared goggles with World War Two era rifles. Strap in, folks – it’s about to get weird. If you have any theories about what this means for Kojima’s new project, feel free to speculate down in the comments.